We envision a world without Lyme and other tick-borne diseases. Our mission is to provide funding for Lyme and tick-borne disease treatment and research, while delivering tick education and awareness around the globe. 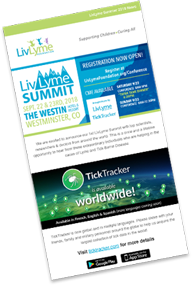 The LivLyme Foundation is a nonprofit organization providing financial assistance to families of children suffering from Lyme disease, funding scientists for Lyme and tick-borne disease research, while delivering tick education and awareness around the globe. We envision a world without Lyme and other tick-borne diseases. We are here to serve children battling Lyme disease and support the people making a difference to cure it. We are honest, ethical and accountable. We aspire to excellence in all that we do. Compassion, transparency and results will keep donors connected to us and our cause. Responsible stewardship of donations will be easy for all to see. We will build relationships with people from every group and community to work toward our vision.